A Night at the Cinema in 1914 is a collection of fourteen short films which recreates the typical variety that a cinemagoer might have seen one hundred years ago. Feature films were still rare back then so these shorts are what your great-great-great-grandparents might have watched if they’d nipped down to their local cinema after a hard days doing whatever it was that your great- great-great-grandparents used to do. The fourteen films vary in length from Looping the Loop at Hendon a couple of minutes of stunts performed by pioneering aviators that you wouldn’t want to take a leisurely blink during, to Egypt and her Defenders, a colour tinted travelogue of the famous sights of Egypt which just goes on and on and on. Some nice fezzes though. It turns out there was a lot going on in 1914, what with Emmeline Pankhurst petitioning the King at Buckingham Palace and Ernest Shackleton undertaking another trip to the Antarctic. And then in June, of course, somebody assassinated Archduke Franz Ferdinand and then everything really kicked off. The selection of films that the BFI have put together covers a variety of genres from newsreels to drama to comedies. There’s an instalment of The Perils of Pauline, an American import, hugely popular at the time presumably because it ticks all the ‘thrilling serial’ boxes: an escaped hot air balloon, moustached villains, burning buildings and a satisfying amount of damsel-in-distressery. Dogs for the Antarctic is a quick magazine-style film of dogs being trained to accompany Shackleton on his upcoming polar exhibition. The purpose of this film being to: (1) remind audiences how totes adorbs dogs are, much like all ninety million dog videos on YouTube in 2014, and (2) sell Spratt’s Dog Cakes. It’s pretty shameless the way the dogs are paraded past half a dozen enormous signs urging you to “Ask for Spratt’s Dog Cakes” in a way that our supposedly overly-commercialised generation would find a bit much. And you can’t even get Spratt’s Dog Cakes any more. I asked everywhere. News films include footage of the wedding of Archduke Karl who succeeded Franz Ferdinand to the imperial throne of Austria. The film shows a bunch of people dressed in their best clothes, trying to pretend that they haven’t seen the film cameras and looking really, really awkward. An approach that has been painstakingly emulated in every wedding video shot ever since. Some people walking like an Egyptian, yesterday. Scouts’ Valuable Aid shows how young people were contributing to the war effort with a couple of earnest looking Sea Scouts on a clifftop lookout. At first glance, these lads with their knee-high socks and tidy hair struck me as rather sweet and naive-looking, unlike the worldly teenagers you get today. Then I remembered that there was an actual, real-live war on with a genuine chance of an invading fleet hoving into view and realised that modern teenagers don’t know they’re born. And neither, in fact, do I. The German Occupation of the Historic Louvain shows heartbreaking footage of the destruction of the historic town of Louvain and its ancient university library while Christmas at the Front purports to show troops celebrating Christmas at the front somewhere we can’t be told for reasons of National Security. It’s the least Christmassy thing ever. God, it looks miserable. At least the cinemagoers of 1914 had plenty of comedy to distract them momentarily from the death, destruction and relentless grimness of war. Daisy Doodad’s Dial is a daft little film about a woman who enters a face-pulling competition and freaks people out so much when she’s practising in the street that she ends up getting thrown in jail. Because apparently they used to imprison people for being funny-looking in 1914. Lieutenant Pimple and the Stolen Submarine was part of a series of Lieutenant Pimple films made by brothers Fred and Joe Evans presumably with a budget of any money they happened to find down the back of the sofa. It’s unashamedly silly and revels in its terrible props and nonsensical plot which revolves around Lieutenant Pimple buying a submarine for the War Office which then gets stolen by some dastardly spies. You can tell they’re dastardly by their beards. There’s some cerebral humour provided by political cartoonist Lancelot Speed whose cartoons are drawn in front of our very eyes and then animated a bit. They are probably a hugely clever and scathing critique of the German armies in France at the time if you understand all the references (which presumably people at the time did). I reckon Speed had the outlines already drawn out though. Rolf Harris used to do that on Rolf’s Cartoon Club, you know. We should have known from that he wasn’t to be trusted. Most of the musical accompaniment for the films was provided by a new improvised score from Stephen Horne which recreates the feel of the music that the original audience would have had provided by a live pianist at the cinema. The Rollicking Rajah is something else though. When the film was originally sent out to cinemas, it would have been accompanied by a synchronised sound disc to be played at the same time. The original soundtrack has been lost but a new version has been created from the sheet music. As this technique predates the talkie and yet fulfils exactly the same function as a talkie, I am not sure why it wasn’t used more often. Possibly because it was a massive pain in the arse. The rollicking rajah himself – blacked up and dressed in a turban – looks uncannily like Paul Whitehouse. He’s Arthur Atkinson but thirty years earlier and with more racism. The final film in the collection, A Film Johnnie, has the biggest name in it. Not just the biggest name in this film collection but the biggest name in cinema ever, although back in 1914 young Charles Chaplin was just starting out in movies and wouldn’t have been the massive box office draw that he later became. This was the year that he first started making movies in fact, and he clearly started as he meant to go on chaplining it up with his trademark hat, moustache and funny walk, being everything that Mr Bean could only dream of being years later. 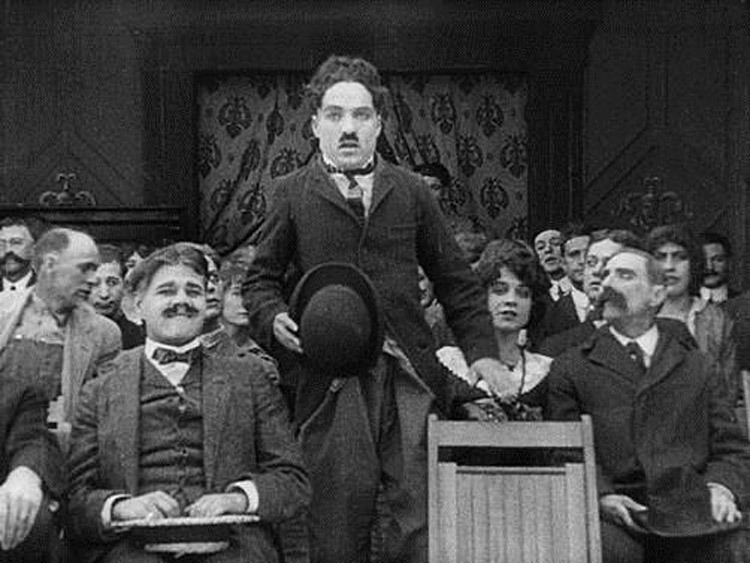 Chaplin made over thirty films in 1914. I told you it was a significant year. A NIGHT AT THE CINEMA IN 1914 , a compilation of shorts from the BFI National Archive with music by Stephen Horne, opens on 1 August 2014 at BFI Southbank and selected cinemas nationwide, with special screenings at 20 independent cinemas on 4 August. Every time I try to comment on how much I love this post I keep getting thrown out of WordPress, or I hit the wrong button or the internet simply eats the comment. I’ll try again. I LOVE THIS POST. Especially Spratt’s Dog Cakes, which I expect contain less dog than you’d think. I was just about to say the same. More please writer. More more more.